Pirate movies have made pirates look so cool. But were real pirates like Jack Sparrow, swaggering and charming? Pirates have been around in one form or another for hundreds of years, and in the 18th century there was a spike on piracy. This is why it was known as the ‘Golden Age of Piracy’. St. Augustine has been threatened by pirates since its birth in 1565, when Pedro Menendez de Aviles came to the shores of St. Augustine and made it a colony. At the time the Spanish were in power but the English and French wanted to take the area for themselves. The Spanish knew of the dangers lurking across the seas, so they build a fort. The Castillo de San Marcos was constructed between 1672 and 1695 and it protected St. Augustine’s Spanish residents from attacks and even from hurricanes. As you can imagine, the Spanish were not fond of pirates and executed them whenever possible. St. Augustine became incredibly important for trading because of its connection to the Gulf of Mexico. It was easy to travel to in comparison to going through the coast and risk losing goods due to unpredictable weather patterns. As trade became a huge part of life in St. Augustin, so did the threat of pirates. To counteract some of these threats, the Spanish were known to hire pirates themselves to fight off enemies! 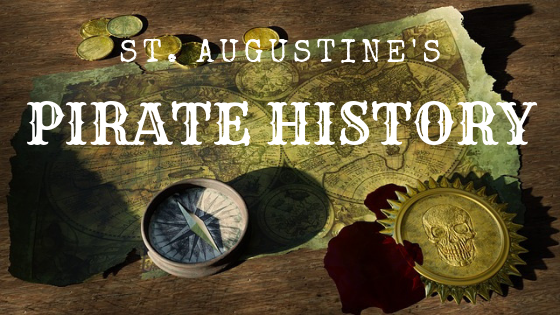 Do you want to know more about Pirates and how St. Augustine dealt with them? Here are a few places to come and experience their history! The St. Augustine Pirate and Treasure Museum has a wonderful outdoor courtyard overlooking the Matanza River and the Castillo de San Marcos. With Educational tours, group tours, and a treasure shop, it’s an exciting trip back into the 1800’s! Come aboard the Black Raven Pirate Ship, at the Municipal Marina in Downtown St. Augustine. This tour offers a variety of packages, from birthday parties, to late night adult cruises! Cupcakes, souvenirs, and beverages (alcoholic and non) are available on their on-board gift shop. With a treasure hunt and a rum runner, adults and children alike will have plenty of entertainment. You just have to come and experience it for yourself! Explore the 18th century in Colonial Quarters! It’s a journey into the past history of St. Augustine. Walk through the boardwalk, marvel at all of the flags, and experience a live musket demonstration. This demonstration will show you how residents fought off the invading pirates! The Castillo de San Marcos is the oldest masonry fort in the United State. It sits on the Western shores of the Matanza River. Come to experience over 340 years of history and see where the Spanish fought and conquered pirates. Standing on it’s limestone floors, looking out at the water, you could easily imagine pirates coming over the horizon on their ships! There is much to see and experience in St. Augustine. It’s a place with a rich history, so come and see what the city can teach you and your family about the pirate life!